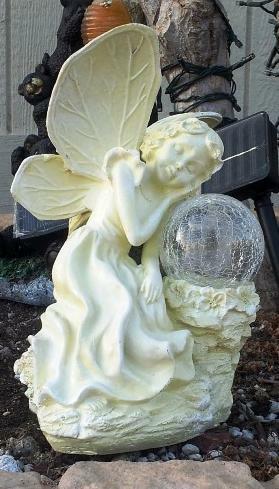 Create a romantic atmosphere to your flowerbeds, patio or pathway with this beautiful and elegant resting solar angel with solar gazing ball. This solar figurine features a angel resting on a solar ball, which provides the housing for the solar light. The solar panel collects sunlight for the two rechargeable 'AA' Ni-Cad batteries (included and installed), providing hours of enjoyable decorative lighting.